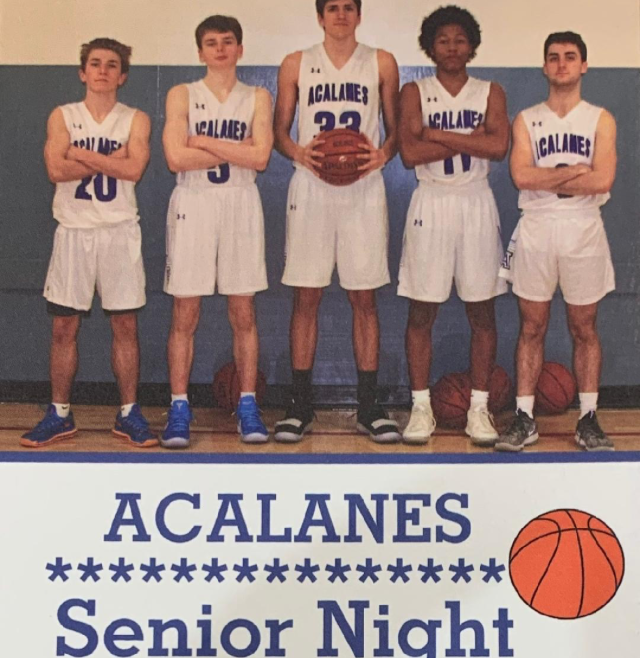 In front of the largest and loudest crowd of the season led by the school band, Acalanes honored seniors Ian Archer, Clark King, Jackson Kirke, Ben Lauer, and Jack Wickline in their final game at Acalanes, against the defending league champion Las Lomas Knights. After a pregame ceremony recognizing the seniors and their families, the five longtime friends and classmates took the floor to start the game for one last time. In an evening filled with a wide range of emotions, the sophomores and juniors did everything they could to make sure that their senior teammates went out as winners. With the five seniors starting, sophomore co-captain Scott Ruegg yielded his starting position and came off the bench for the first time this season. Starting with a 28-footer, he proceeded to torch the Knights for 17 points in the first half including 5 3-pointers. His fellow co-captain, senior guard Ian Archer, continued his brilliant play from the huge upset earlier in the week over College Park with 14 points and five assists in the first half. Archer hit a tough shot as the first quarter ended to give the Dons a 21-19 lead. In the second quarter, Archer hit junior forward Aidan Bodner for a layup to put the Dons up 34-32. That started a 15-0 run, and the Dons entered the locker room at halftime flying high with a 47-32 lead. With players returning from last year’s state championship game against Lonzo Ball’s high school including a 225-pound Division 1 football commit clearing out the paint, the NCS-bound Knights were not going down without a fight. They got physical with the Dons in the third quarter and sought to deny Ruegg the ball and prevent him from getting a clean look at the basket. This strategy figured to open things up for Archer’s playmaking, but early in a disastrous third quarter he went to the floor hard, and was injured and out for the game. Five minutes into the third quarter, the Dons had yet to score. After a 7-0 run, the Knights had cut the Dons’ lead to 47-39. Dons junior center John Kalil went strongly to the basket and drew a shooting foul. He then drained his two free throws to get the Dons on the scoreboard in the second half. Ruegg next broke free on a drive and found Bodner who laid it in, was fouled and hit his free throw, and the Dons were up 52-39. But the Dons scored only those five points in the third quarter, and the Knights went on a 10-0 run to close it out. The Dons entered the final stanza clinging to a 52-49 lead. After Las Lomas hit a 3, the lead was gone. But Ruegg drove for a layup to put the Dons up 54-52. Sophomore guard Jackson Aris-Dumas hit a 3 to extend the lead to 57-52, but the Knights hit two free throws and scored again to cut the lead to a point. Ruegg then found Kirke open for a bunny to put the Dons up 3, 59-56. After the Knights hit a pair of free throws, Bodner, who finished with 5 assists, hit sophomore forward Joey Carrillo for another bunny to make it 61-57. Las Lomas again made 2 free throws. With 33 seconds left, Carrillo brought the house down after scoring inside while being fouled. On the next play, fighting for a rebound, Wickline forced a jump ball to give the Dons possession. However, he took a blow to the face from a Las Lomas player and began gushing blood, and the Dons lost their second senior due to injury. Down four without the ball, Las Lomas was forced to foul and fouled Kirke. The senior center stepped up to the charity stripe to shoot the front end of a 1-and-1 with 25 seconds left. The gym erupted after he hit the first free throw and again when he swished the second. Las Lomas still managed to make it interesting after hitting a 3 and forcing a turnover, but the Knights’ last second desperation heave was off the mark, and the Dons prevailed 65-62. 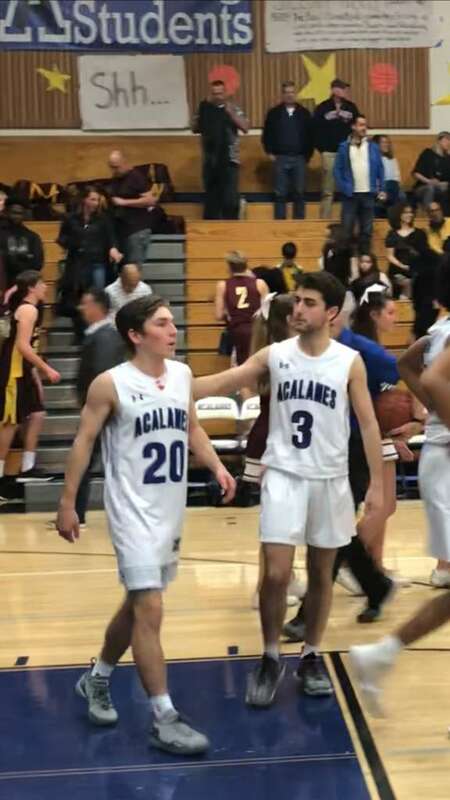 As the Acalanes band played, students and families came onto the court to celebrate with the seniors before they left the court for the last time.